The ST25R3916 is a high performance NFC universal device supporting NFC initiator, NFC target, NFC reader and NFC card emulation modes. The ST25R3916 includes an advanced analog front end (AFE) and a highly integrated data framing system for ISO 18092 passive and active initiator, ISO 18092 passive and active target, NFC-A/B (ISO 14443A/B) reader including higher bit rates, NFC-F (FeliCa™) reader, NFC-V (ISO 15693) reader up to 53 kbps, NFC-A and NFC-F card emulation and NFC-A and NFC-F card Emulation. Special stream and transparent modes of the AFE and framing system can be used to implement other custom protocols such as MIFARE® Classic in reader or card emulation mode. The ST25R3916 features high RF output power to directly drive antennas at high Efficiency. The ST25R3916 also includes several features, which make it incomparable for low power applications. It contains a low power capacitive sensor to detect the presence of a card without switching on the reader field. Additionally, the presence of a card can still be detected by performing a measurement of the amplitude or phase of the antenna signal. It also contains a low power RC oscillator and wake-up timer to automatically wake-up the ST25R3916 after a selected time period and check for a presence of a tag using one or more techniques of low power detection of card presence (capacitive, phase or amplitude). 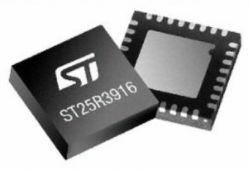 The ST25R3916 is designed to operate from a wide power supply range (from 2.4 to 5.5 V), and a wide peripheral IO voltage range (from 1.65 to 5.5 V). Due to this combination of high RF output power, low power modes, and wide supply range the ST25R3916 is perfectly suited for infrastructure NFC applications.